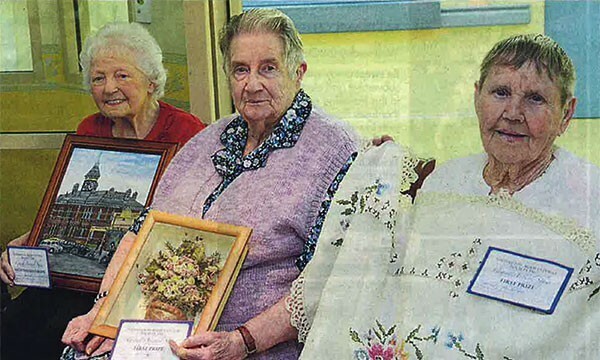 The nimble fingers of three Rodney Park Village retirees earned the praise of craft judges at this year's Shepparton Agricultural Show. No-one was throwing any matches when Amazing Aileen faced-off against Electric Eileen and Dynamic Dot in the fiercely competitive Shepparton Villages bobs, gold medal match. Residents at a Shepparton aged-care facility enjoyed food and festivities from across the globe last Tuesday. An excited crowd gathered yesterday as Peg Edwards and Mim Guilfoyle stepped onto the mat. The first residents of 15 new independent living units at Tarcoola Village started moving in on Thursday night. Construction of a new synthetic bowling facility at Tarcoola Village is well under way after a 1.2m-deep hole for the $140 000 three-rink green was dug during Monday and yesterday. Retirement turned Coleam-bally farmer Eddie Rooks from a man without a shed to the president of one. Three Goulburn Valley organisations for elderly or disadvantaged people on Tuesday received a combined $22 900 from Freemasons Victoria. Stage one of redevelopment will include 15 units, bowling green and activity centre extension.